Taking popular heartburn drugs for prolonged periods has been linked to serious kidney problems, including kidney failure. The sudden onset of kidney problems often serves as a red flag for doctors to discontinue their patients' use of so-called proton pump inhibitors (PPIs), which are sold under the brand names Prevacid, Prilosec, Nexium and Protonix, among others. But a new study evaluating the use of PPIs in 125,000 patients indicates that more than half of patients who develop chronic kidney damage while taking the drugs don't experience acute kidney problems beforehand, meaning patients may not be aware of a decline in kidney function, according to researchers at Washington University School of Medicine in St. Louis and the Veterans Affairs St. Louis Health Care System. Therefore, people who take PPIs, and their doctors, should be more vigilant in monitoring use of these medications. The study is published Feb. 22 in Kidney International. The onset of acute kidney problems is not a reliable warning sign for clinicians to detect a decline in kidney function among patients taking proton pump inhibitors, said Ziyad Al-Aly, MD, the study's senior author and an assistant professor of medicine at Washington University School of Medicine. "Our results indicate kidney problems can develop silently and gradually over time, eroding kidney function and leading to long-term kidney damage or even renal failure. Patients should be cautioned to tell their doctors if they're taking PPIs and only use the drugs when necessary." More than 15 million Americans suffering from heartburn, ulcers and acid reflux have prescriptions for PPIs, which bring relief by reducing gastric acid. Many millions more purchase the drugs over-the-counter and take them without being under a doctor's care. The researchers -- including first author Yan Xie, a biostatistician at the St. Louis VA -- analyzed data from the Department of Veterans Affairs databases on 125,596 new users of PPIs and 18,436 new users of other heartburn drugs referred to as H2 blockers. The latter are much less likely to cause kidney problems but often aren't as effective. 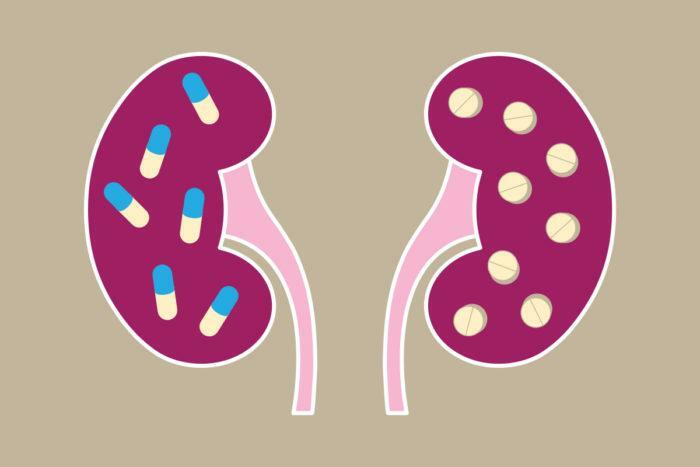 "Doctors must pay careful attention to kidney function in their patients who use PPIs, even when there are no signs of problems," cautioned Al-Aly, who also is the VA's associate chief of staff for research and education and co-director of the VA's Clinical Epidemiology Center. "In general, we always advise clinicians to evaluate whether PPI use is medically necessary in the first place because the drugs carry significant risks, including a deterioration of kidney function."